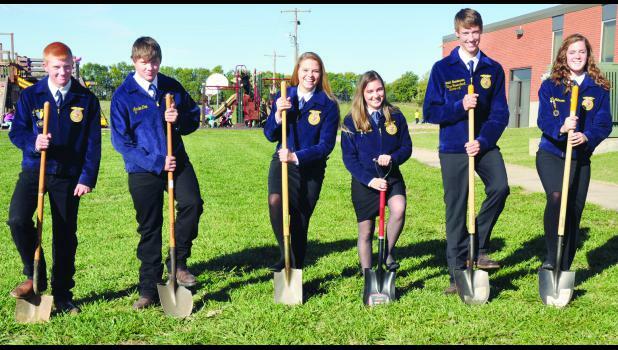 Royal Valley High School FFA officers broke ground on a new greenhouse Thursday after receiving a $10,000 grant from America’s Farmers Grow Rural Education, which is sponsored by the Monsanto Fund. The greenhouse is being built for agriculture students at the school, and it will allow them to grow vegetable crops and bedding plants, calculate fertilizer applications, plan layouts for maximum yield, perform various propagation practices and experience many aspects of running a horticulture business. The greenhouse will provide students with the laboratory space to conduct experiments and projects and will be operational from September through May. The structure will include roof vents, heaters and fans. Kim Mitchell, agriculture teacher, said that there are more than 80 students enrolled in agriculture classes this semester, and the school’s FFA Chapter has 34 members. The chapter was reinstated at Royal Valley last year after it was disbanded in 2005. Mitchell said that giving the students access to a greenhouse will improve their learning. Right now, students are growing some plants in the agriculture classroom using florescent lights and metal bookshelves. Support for a greenhouse in the district began growing even before the district was nominated for the grant. In February, Jackson County farmer Sandy Rickel directed a $2,500 donation to the re-established agriculture education program. Rickel received the grant through the America’s Farmers Grow Communities program. “Without the support of our local farmers, we would not be in the position to continue to grow our agriculture education program and expand the opportunities for our students,” Pfrang said. This past spring, several local farmers nominated the district for a chance to apply for the $10,000 grant. Those farmers included Jerod Ribelin, Jerry and Chasity Rickel, Jim and Sandra Rickel, Kyle Ribelin and Gayle Stithem. Districts throughout the Midwest were nominated, and school administrators then designed a math or science-based project for the grant application. Once all of the school district applications were submitted, a panel of math and science teachers reviewed each application and selected finalists. An advisory council, composed of farmer-leaders with an interest in agriculture and education, then selected the winning grant applications from a pool of finalists. Royal Valley celebrated receiving the grant on Thursday during the groundbreaking ceremony for the greenhouse. Nominating farmers, school representatives and local Monsanto representatives Brian Garrett and Pamela Schlodder attended the event. The greenhouse, which will sit behind the elementary and high schools, will measure 30 feet by 48 feet. Members of the school board plan to bid out contractors for the construction of the greenhouse in the next few months, with construction expected to begin late winter or early spring. The greenhouse is expected to cost $42,000 plus installation and additional site work.